This area allows you to choose the two ways in which the workflow can be activated. 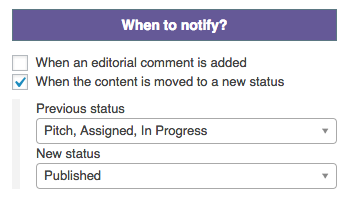 For example, in the following image, notifications will be sent when content is moved from the “Pitch”, “Assigned” or “In Progress” status to the “Published” status. This area allows you to choose which content will trigger the notifications. In this next image, notifications will be triggered only for Posts in the “Uncategorized” category. Site Administrator: This is not an individual user. This refers to the email address entered in the “General Settings” area of WordPress. Because this is an email address, the notifications are always sent by email. Authors of the content: Notifies the users who are set as the authors of the content. Using the Multiple Authors for PublishPress add-on you can select multiple authors and all will receive the notification. Users: You can select multiple users, searching for them by name or filtering only the selected ones. Only users with the minimum role of “Collaborator” will be available on the users list. Roles: You can select multiple WordPress user roles. These can be customized using the “Roles” feature in PublishPress. 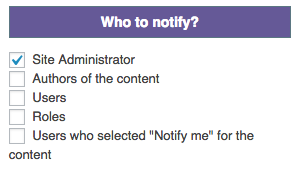 Users who selected “Notify me” for the content: Click here to read about this feature. This area allows you to control the content of the notifications. The content sent in the notifications can easily be customized. The notifications support HTML for email and plain-text for Slack notifications. You can add dynamic information to the Subject or Body text using shortcodes following the format explained in this documentation article. Each user can decide where to receive the notification, or they can mute the notification. By default, the notifications are sent by email. But you can extend that using add-ons like Slack for PublishPress. 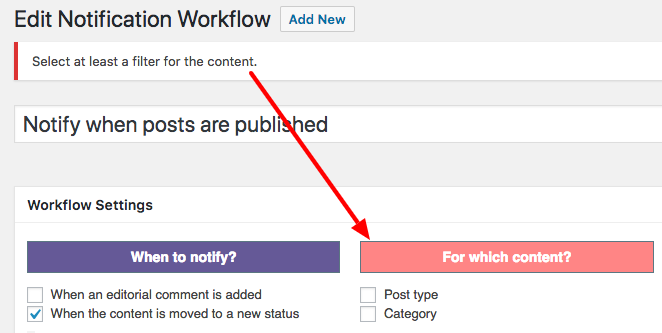 PublishPress does require you to make a selection for all 4 options in a Notification Workflow. For example, if you don’t make a choice for the “For which content?” option, you will see this message.